We’re officially halfway through this chapter of Follower, and there are opportunities on almost every page up until the end for character cameos! I’ve added an extra pricing tier for a smaller cameo appearance on just one page at a lower rate. 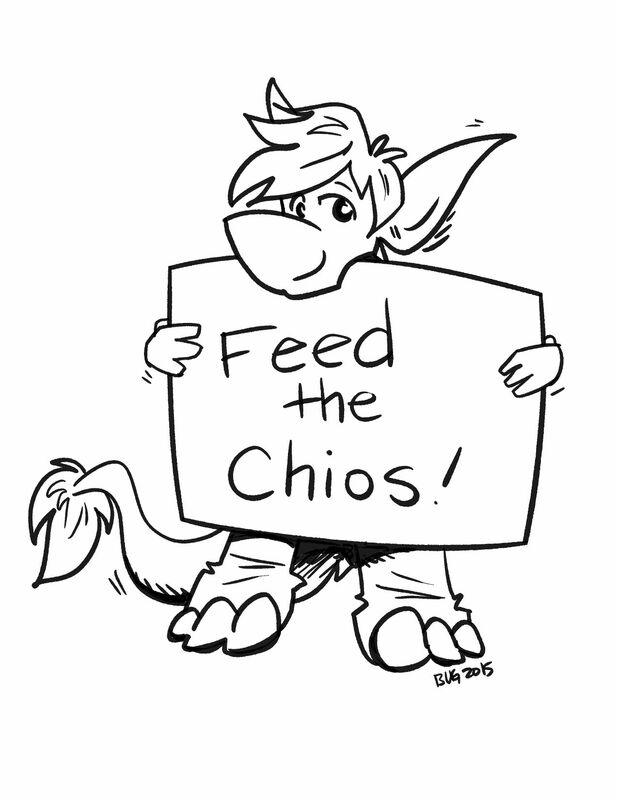 If you’d like to leave your mark on Follower as a Vloxen/Chio geneticist, check out this page or leave a comment for more information! It’s that time of year again! No, not Chiomas! I’m currently looking to cover my 2017 webhosting, which includes Follower, Messenger, and Radio Chio. If you contribute anything to my Ko-Fi, I’ll send you a thank you Chio doodle in return! You can also contribute via Patreon or buying something from the shop, but those come with their own rewards. As always, sharing Follower with your friends is much appreciated! The best way to help support the comic is to help it find new readers. New Discord! TWC Votes! Create a Chio continues! There’s a new Messenger/Follower Discord! Hop in and talk about whatever. I also added special roles for Patreon backers, just for fun! I’m hoping to move Follower up the ranks on TWC this month if I can. I have a few incentive doodles, and there’s a new one this week. Help me find new readers for the comic and give me a vote! I also took a better look at the comic script alongside a calendar, and I can definitely leave Create a Chio commissions open longer than I originally thought. So, if you’d like to insert a custom character into my comic forever and ever, here’s your chance! I’m also thinking about making a cheaper version with fewer appearances and options, but I’m not sure anyone will care! Create a Chio and cameo in Follower! Chapter five of Follower is here at last, and boy do I need a whole bunch of new Chios/Vloxen for this chapter! This is where you can step in to become an honorary Project Cottontail geneticist and help out! We’ve decided to open up commissions for custom Chio characters, which will also cameo in chapter 5 of Follower! You’ll be able to customize your character’s name, fur, hair, and eye color, hairstyle, and personality, and I’ll work with you to come up with a character that’ll fit into the world of the comic. 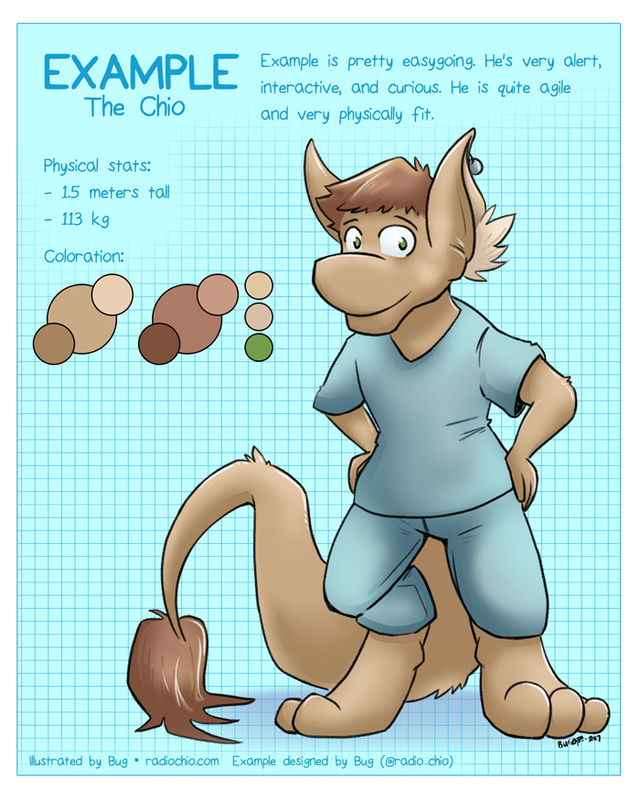 You’ll also receive a full-body illustration of your character with reference data, as shown below! Since this is a pretty time-consuming and detailed project, and one that will leave a permanent impact on the comic, a cameo Chio will be $150. These commissions will close near the end of April to ensure there is time to design the character and get them into the comic! For more details and terms, as well as other commission opportunities, please check out my shiny new Commiss.io page! None upcoming! Check back later. Fan works are copyright to their respective creators. Please do not duplicate, alter, redistribute, or republish images or other content from this site without permission.